Paycheque + weekend + games to trade = financial disaster!Yes, now I have yet another box – albeit a little one – to keep my NES, SNES, Genesis, N64, and PS2 happy – a Nintendo Gamecube! I had intended to simply buy a new PC game at Gamerama (on Yonge St. north of Eglinton in Toronto) subsidized by 3 crappy games I traded in, but they had nothing worthwhile on their PC shelf. With that adorable purple lunch pail staring me in the face for only $60 I just couldn’t resist. Along with the controller I picked up a 2MB memory card and 2 games – Super Mario Sunshine and Resident Evil 4. Despite glowing reviews and a lot of personal anticipation I was reluctant to pick up RE4 since a PC version is immanent, but one of Gamerama’s knowledgeable staff noted that Konami has a pretty awful track record in porting console games to PC so I splurged $30 for a brand new copy. 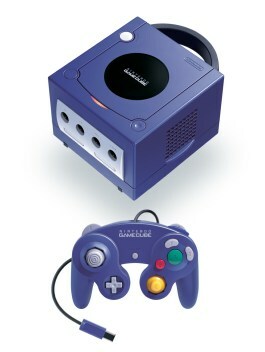 The design of the Gamecube is attractive, utilitarian, playful, and sturdy. Compared to the very sleek slim formfactor of my second generation PS2, the GC looks like a toy. This Volkswagen Beetle of consoles positively smiles at you with its soft features and many curves. The attached carrying strap makes for easy luggage while the asymmetrical plugs are congruent only in one orientation so you can’t plug anything in the wrong way. The console was easy to set up. I just plugged in the RCA and power and away I went. The firmware is simple but sufficient with a clock, memory card manager, and media information. Plus, the boot screen looks and sounds really cool! Regardless, this is a DAMN comfortable gamepad. It’s a real treat for my hands, for one. I’ve heard complaints that the GC gamepad isn’t friendly with large hands, but they don’t come a lot larger than mine and my mitts hug that purple doohickey like a Teletubby. This gamepad is obviously an evolutionary step toward the DS and Wii as the tactile experience of the layout is just as important as the function of each button in a game. For example, in Resident Evil 4 the oversized A button is a contextually sensitive all-purpose “do that!” button. Ancillary buttons do ancillary tasks related to the A button in some way, such as Y for inventory X for item manipulation. The oddly situated Z button is a perfect choice to bring up the map since, even though it is placed closely to the very important R button (to aim your gun), L and R are formed to keep your fingers in place so Z always within reach but never pressed accidentally. The shoulder buttons are pressure-sensitive as well which makes for very precise squirting in Super Mario Sunshine. I really appreciated that the in-game tutorial acknowledged the controller design by distinguishing the difference in action functionality between pressing in the button partly (squirt and run) and fully beyond the click (squirt and stand still). The controller design alone is a master stroke by Nintendo. 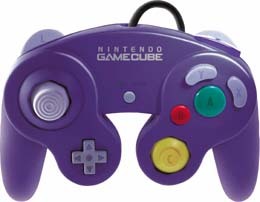 It is obvious that they are interested in engaging players on an advanced tactile level, and the Gamecube’s controller is a perfect precursor to the “revolution” that will be the Wii’s freefloating whatchamacallit. The buttons on the gamepad are each shaped uniquely which not only helped me get used to the layout more quickly (it seems that in tutorials, games illustrate the button itself, shape and all, instead of simply dictating the emblazoned letter). The rumble feature is a nice touch as well, though certainly not unique. The overall synergy between player and console is second to none thus far. The graphics on this system are very impressive! While playing Soul Calibur 2 at a friend’s house we marveled at the surprisingly smooth diagonals and wispy curves of the characters and backgrounds. Is this console antialiased? It certainly seems so as SMS and RE4 are equally jaggy-free. These two titles are a great example in contrast of the graphical genres the GC can churn out. SMS is brightly coloured, lightly cell shaded, and sports a blazingly smooth frame rate. The roundness and detail of characters is really attractive and minute, and special effects like particle smoke, fog, and distance blur lend a lot of convincing flare to close-up objects and sweeping distant scenery. RE4, on the other hand, is perhaps the most realistic-looking game I’ve ever seen. This is certainly due in no small measure to the expert programming of Konami’s coders and designers, but couldn’t have been accomplished without such a robust platform. There’s just the right amounts of haze, “bad TV reception”, and balance between texture clarity and polygon count to make some objects – particularly a frightened dog near the beginning – EERILY lifelike. You don’t have to squint to be tricked into doing a double-take in some areas of this game. And goodness gracious, between the visual presentation and the incredible audio work, this game is intense, terrifying, and mercilessly graphic. Late adopter and dimestore technologist that I am, I’m thrilled to own such a professionally crafted hardware platform. I’m really looking forward to thickening-up my GC collection as this is clearly a well-refined console worth investing in. At a scant $60 for the unit and $30 for new software this is a brand I’m very happy to be supporting once again.